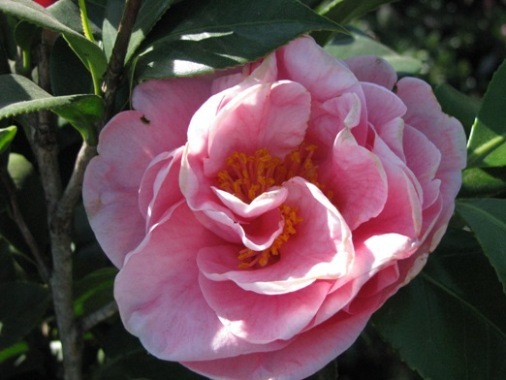 The queen of the winter garden is, without a doubt, the stunningly beautiful camellia. 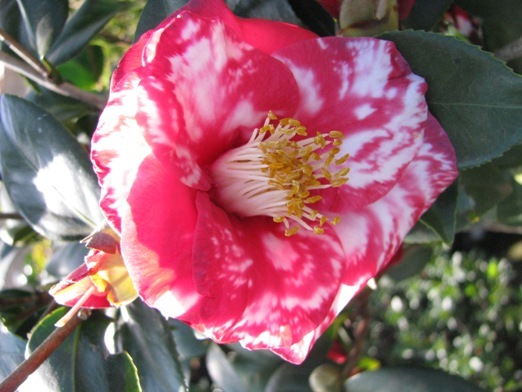 Camellias, with their beautiful blooms in shades of white and pink through to deep crimson and their long flowering season, continue to amaze all who have the good fortune to enjoy them in their gardens. 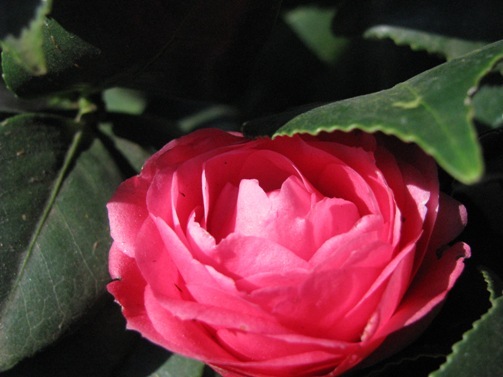 Their dense and glossy evergreen foliage is also attractive, making the camellia a lovely all-year-round garden plant. Comprising some 100 to 150 different species, these evergreen shrubs originate from Asia, with distribution from northern India across the continent to Japan, and then south to northern Indonesia. 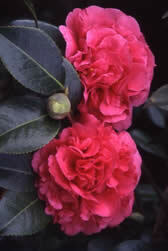 In 1794 the first one arrived in England – a double red camellia – soon to be followed by others. The appeal and fascination of this classic flower rapidly spread across Britain and into Europe. Plant breeders have created a variety of hybrids and cultivars that make ideal garden plants. 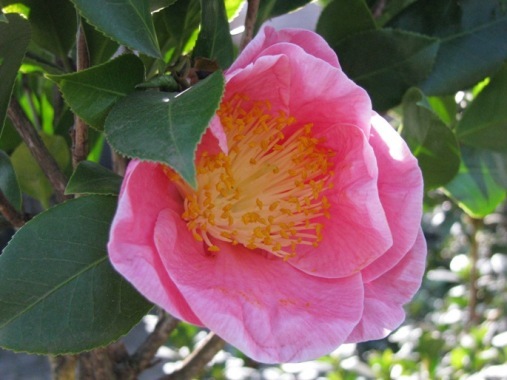 Most of these derive from three particularly attractive species, namely the autumn flowering Camellia sasanqua, the winter-flowering Camellia japonica and the large-flowered Camellia reticulata, that ends the beauty parade in spring. ‘Crimson King’ – small, single mahogany red blooms with prominent yellow stamens. ‘Jennifer Susan’ – small, clear pink peony-like blooms, vigorous grower. ‘Setsugekka’ – large, white single to semi-double blooms. ‘Sparkling Burgundy’ – ruby-rose with lavender sheen, loose peony-like blooms. ‘Weroona’ – single white edged with pink blooms, very early flowering. ‘Debutante’ – light, shell pink, full peony-like blooms. ‘Elegans’ – large rose pink, blotched white, anemone-like blooms. ‘Kramer’s Supreme’ – very large, turkey red, peony-like blooms. ‘Margaret Davis’ – creamy white with mottled rose edges to petals, tight peony-like blooms. ‘Guillio Nuccio’ – large semi double, salmon-red flowers. 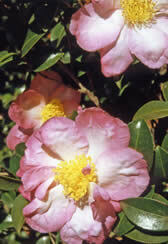 ‘Yours Truly’ – pink streaked with deeper pink and bordered white, free-flowering. ‘Anticipation’ – very free flowering, large peony-formed blooms, deep rose. ‘Baby Bear’ – dwarf, compact shrub with masses of tiny, single pink flowers. ‘Donation’ – semi-double orchid pink blooms, outstanding in cold climates. 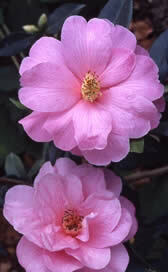 ‘Dream Girl’ – very large, flat flowers, pink with golden stamens. Tall vigorous grower. ‘Dr Clifford Parks’ – huge red blooms with an almost orange overtone. ‘Francie L’ – enormous rose-pink blooms with wavy petals, outstanding garden plant. ‘Citation’ – large ruffled soft pink blooms make this a great favourite. ‘Miss Tulare’ – very large, full peony-like blooms, red to rose-red. ‘Valley Knudsen’ – an unusual deep orchid pink. C. granthamiana – unlike any other camellia, huge single white flowers with clusters of golden stamens in autumn. C. lutchuensis – grown for its strong fragrance, tiny white flowers cover the bush through winter. C. rosaeflora – tiny, single pink flowers cover the tree in winter. Camellia nitidissima (syn C. chrysantha) with golden yellow blooms and prominent veining on pale green leaves. Plant them in well-drained soil which is rich in humus. Keep their root zones cool through the heat of summer with a thick layer of mulch in the form of leaf mould, pine needles or pine bark. Water them regularly during the flowering season to dramatically reduce the incidence of bud drop. Contrary to popular belief, they are not that sensitive to soil acidity or alkalinity. Many may benefit from an annual application of dolomitic lime in areas where soils are strongly acidic. Tip: Dappled shade from mature trees is ideal for most, though some are more sun tolerant than others. Too much shade reduces bud formation, whilst excessive heat and sunshine scorches fine surface roots and flower buds.